People speak 5 – 7,000 languages in the world now. But one language dies every two weeks. Linguists think that, in 200 years, there will only be about 200 languages (one for each country). And in 2300, maybe we will all speak one language. Half the languages of the world might die in 100 years. Less than a third of the world’s languages have a written form. So most people do not have education in their first language. 87% of Africans do not have education in their first language. Less than 10% of the world’s languages are used in education. The official language of a country is usually related to the past: colonisation, history or geopolitics. Not the language that the people really speak. 90% of Africans do not know the official language of their country. At least 40-50 million people in the EU (10%) speak a language that is not the official language of their country. Less than 4% of languages have official status in the countries where people speak them. Most of us speak the same languages already – 96% of the population of the world speak only 4% of the languages. Six of the top 10 languages are from countries that had colonies: English, Spanish, Russian, Portuguese, German and French. Almost 500 languages have less than 100 people who speak them; about 1,500 languages have less than 1,000; 3,340 languages have less than 10,000 speakers. Social media and the internet might help bring some dying languages back to life. Language groups can connect better now if they live in different areas. In 2000, at least 500 languages were used on the internet. In 2012, FirstVoices started an iPhone App. It lets people who speak indigenous languages from North America, Australia and New Zealand / Aotearoa text, email and chat on Facebook and Google Talk in their own languages. Wikipedia has articles in 250 languages. Microsoft has a Local Language Program. It lets people change their software language to nearly 100 different languages. But that is only 6% of written languages. Some countries have many languages. Papua New Guinea has the most languages (836) with a population of only 6.5 million people. Europe has the least languages – only 3% of the world’s native languages. Papua New Guinea – 836; Indonesia – 707; Nigeria – 529; India – 454; United States – 420; China 301; Mexico – 288; Cameroon – 281; Australia – 245; Brazil – 228; DR Congo – 215; Philippines – 192; Canada – 173; Malaysia – 146; Russian Federation – 137; Chad – 132; Tanzania – 127; Nepal - 122; Vanuatu – 116; Burma – 116. United States: 1990 Native American Language Act BUT there were 250 native languages before the Europeans arrived. And only one of these, Navajo, has more than 25,000 speakers. Canada: The Northwest Territories Act in 1877 recognises 9 Native American languages BUT only English and French have official status. Indigenous languages are not recognised officially outside the Northwest Territories. Australia: They started bilingual education in the Northern Territory in 1973 BUT a new law in 2009 said that the first 4 hours of the school day must be in English. Now not so many children go to school. Wales: the National Assembly for Wales (Official Languages) Act in 2012 made Welsh and English equal in the National Assembly BUT the number of people who speak Welsh fell from 21% to 19% between 2001 and 2011. Ireland: in 1937, the Constitution of Ireland made Irish the official first language BUT only 3% of people in Ireland use Irish as their first language. Scotland: Gaelic got official status in the Gaelic Language (Scotland) Act in 2005 BUT Gaelic is not an official language of the EU or UK. Less than 2% of the people in Scotland speak Gaelic. 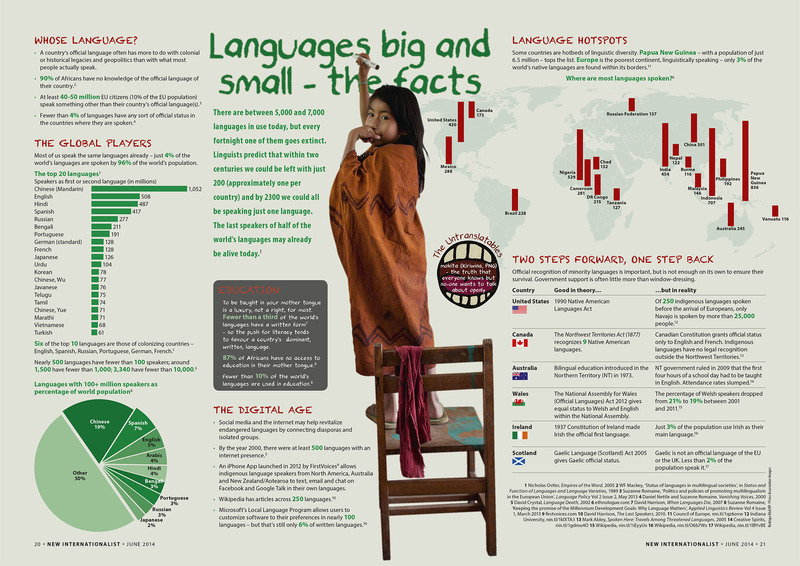 NOW LOOK AT THE ORIGINAL IN THIS INFOGRAPHIC: http://newint.org/features/2014/06/01/languages-the-facts-infographic/ (This article has been simplified so the words, text structure and quotes may have been changed). This page was last edited on 2 July 2014, at 20:23.